In order for anyone to receive financial aid your eligibility for selective service must be determined. Males over the age of 18 but under 26 are required to register for Selective Service whether you are documented or not. Las hembras no se require que se registren. The Selective Service System has not now, or in the past, collected or shared any information which would indicate a man’s immigration status, either documented or undocumented. Selective Service has no authority to collect such information, has no use for it, and it is irrelevant to the registration requirement. Consequently, there is no immigration data to share with anyone. You want to protect yourself for future U.S. citizenship and other government benefits and programs by registering with Selective Service. Do it today. According to law, a man must register with Selective Service within 30 days of his 18th birthday. Selective Service will accept late registrations but not after a man has reached age 26. You may be denied benefits or a job if you have not registered. NOTE: Registering with Selective Service is not signing up for the Armed Services. 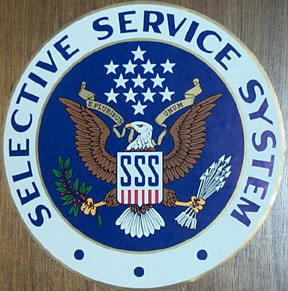 The Selective Service System is not part of the Department of Defense. You can register at any U.S. Post Office and do not need a social security number. When you do obtain a social security number, let Selective Service know! To correct or provide your social security number, please call Selective Service at 1-847-688-6888, between 9:00 a.m. and 5:00 p.m., EST (Eastern Standard Time). To update your personal information, see our webpage on CHANGE OF INFORMATION. Dual nationals of the U.S. and another country are required to register, regardless of where they live, because they are U.S. nationals. See also U.S. NON-CITIZENS AND DUAL NATIONALS – LIABILITY FOR SERVICE. Once a man reaches his 26th birthday, Selective Service cannot register him. Go to our webpage for MEN 26 AND OLDER. NOTE: Non-immigrant men living in the United States on a valid visa are NOT required to register for as long as they remain on a valid visa up until their 26th birthday. See our website for WHO MUST REGISTER.